"Guns only have 2 enemies: Rust and Politicians." So read one of the many signs on Monday at a Second Amendment rally in front of the Washington Monument, where hundreds of people convened in the name of the right to bear arms. But while the gathering had all the high-profile works  official NRA presence, a dramatic backdrop, a fully equipped stage  it lacked the powerful feature of a much humbler rally that was held across the Potomac on the same day: openly carried weapons. The 100 or so gun-rights advocates gathered at Gravelly Point Park in Arlington, Va., gave up the glitz of the Mall to take advantage of Virginia law, which, unlike that of Washington, allows people to carry loaded handguns and unloaded rifles. The spot was chosen by Daniel Almond, founder of Restore the Constitution, a five-month-old group that organized the event. Almond believes attention goes where guns go  even when that place is a park where speeches about constitutional rights are drowned out by planes leaving Reagan National Airport and speakers have to orate from the back of a pickup truck. "This is where you come to get ahold of the nation," said Andrew Graves, who works in ammunition manufacturing in Vermont, as he directed traffic for the event. The strategy appeared to be working. Photographers and camera operators swarmed the ralliers, who wore yellow armbands, and journalists waited in line for interviews. Less successful was Almond's attempt to spread a unified message once his newly formed group had the media's attention. "The concept from the beginning has been that it have a simple message: restore the Constitution," Almond said. But interpreting that document rarely proves a simple matter. The ralliers, many clad in camo and NRA stickers, took varied lines in linking their grievances to guns rights, which have, if anything, been expanding under the Obama Administration. Bills repealing handgun limits and increasing concealed-carry areas have passed in several states in the past year. President Obama even signed a federal law allowing loaded guns in national parks, a freedom that the attendees exercised when gathering that morning in Fort Hunt, Va., before caravanning to Gravelly Point. Nevertheless, as with the Tea Party supporters, those who were present generally agreed that the government had unconstitutionally overstepped what should be the limits of its power; health care reform and the bank bailouts took the worst oratorical beating. But other grievances varied from speaker to speaker. Eric Stinnett, an engineer from Alabama, lambasted everything from school lunches to PBS. Others called for a complete congressional revamping. "We're here to tell you something, guys: You're fired!" said Larry Pratt, executive director for Gun Owners of America, pointing across the river. It's a sentiment reminiscent of Tea Party lines and the calls to overhaul health care in the days before the bill's passage. Although Almond said his organization has no official ties to the Tea Party, one attendee, Michael Rugh, called the rally part of "Tea Party: Phase II"  a more aggressive cousin to a movement he feels is now being laughed at by certain politicians. "We are serious. We are going to do whatever it takes," Rugh said, adding the caveat that he didn't mean anyone would get blown up or shot. That aside may have seemed especially necessary given the date. Almond said the rally was set on April 19 as a nod to the battles of Lexington and Concord, the first skirmishes in the Revolutionary War. But it's also the anniversary of the Oklahoma City bombings and the deadly FBI siege at Waco in 1993. 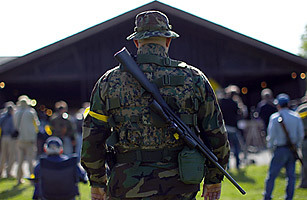 Justin Coleman, a computer programmer from South Carolina, said that weapons were there to serve as a symbol for all basic rights, while others viewed the guns as a more threatening sign of things to possibly come. "The types of laws and things that [Congress is] shoving down our throat, I'm not O.K. with that. It might come down to where the only way to stop that is to remove them, and they're not going to walk away peacefully," said Tim Hammond, a parking-garage manager from California who wore military gear and a colonial-era hat. A few attendees were more explicit in their predictions. "You know in these next two years, it's not gonna be like any other two years you've ever seen," said Pierotte Vassau, who came from New Jersey with the Oath Keepers, a far-right group of former military and police officers. "And I think there will be blood. They can have mine." Almond, however, insisted that brandishing the guns in Virginia was simply meant to highlight what he sees as the great irony of not being able to fully exercise Second Amendment freedoms in the capital. "It's a celebration of what's left of our freedoms," he said. "It's also a message to the other side of the Potomac that we're not afraid to exercise our rights as far as we can."